Decades ago, options for marketing your products and services were very limited. You could only promote your business through tangible materials like brochures and flyers or opt for a heftier priced commercial advertisement in a newspaper, magazine, television, and radio. Although these traditional marketing methods still exist today, the exponential growth and popularity of the internet in the early 90s has paved way for a new method wherein marketers could reach more individuals, regardless of their marketing budget and business size. This new way of marketing is aptly called online marketing. You’ve already encountered it hundreds (even thousands) of times. 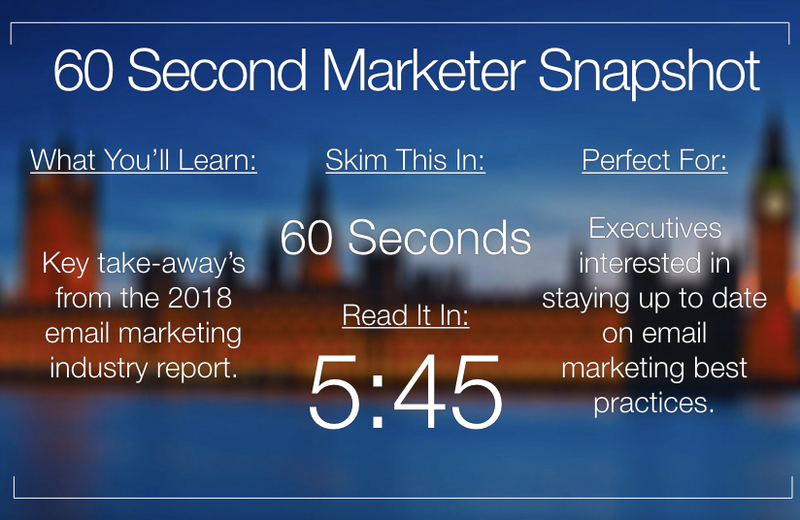 You see it as you scroll through your newsfeed, read an article, and even the 10-second clip before you watch a video is a form of online marketing. This is because, compared to traditional marketing like flyers and television commercial, online marketing uses digital tools and strategies to reach customers like you. One of the most effective digital marketing tactics out there is email marketing. It is the use of emails to market almost anything that you could think of. It could be about new products, time-restricted promos, invitations and more. However, email marketing is not just about sending out emails and hoping for the best. Similar to other digital marketing types like Search Engine Optimization (SEO) and social media marketing, an email marketing campaign should have and meet marketing goals, regardless it’s increasing website traffic or achieving higher conversion rates. Building a campaign, however, can set you back in a confusing haze if you let every single advice you see online cloud your judgment. Thankfully, there are a handful of data-driven insights to set and propel you to the right path. But, what is the status of this email marketing industry today? Do marketers still stick to old and ineffective methods or have they adapted data-driven tactics? The 2018 Email Marketing Industry Report from Campaign Monitor will give you valuable insight on how well the email marketers know and understand their chosen digital marketing field. To learn this, Campaign Monitor gathered data by surveying more than 200 email marketers and questioned 25 experts. With the exponential growth of social media users—there are over 3 billion users in 2018 according to Smart Insights, it’s easy to see why many marketers are transitioning solely to social media marketing. If you are thinking of abandoning your email campaign for social media, don’t. We’re not saying not to invest in the latter but if you completely stop your email marketing you may miss out on receiving the highest Return of Invest (ROI) generator for your company. 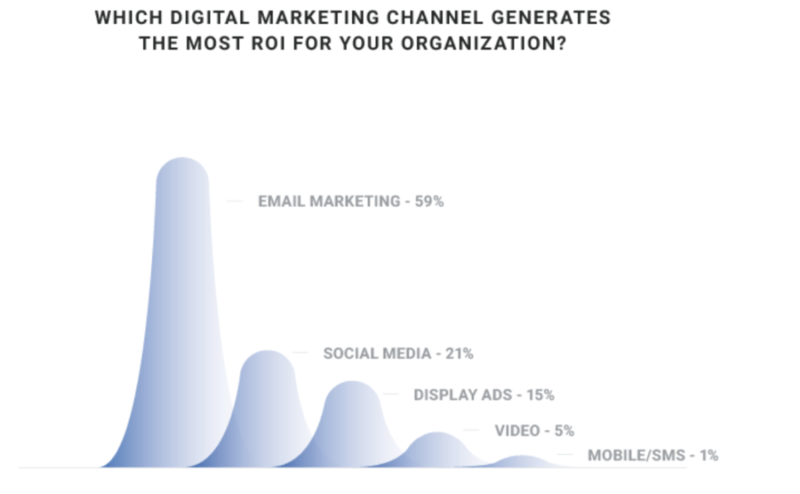 Out of the digital marketing channels—email marketing, social media, display ads, video, and mobile/SMS, can you guess which one rakes in more money? It’s email marketing; it accounts for 59% in ROI, followed by social media at 21%. If you don’t see any return with your email campaigns, ask yourself these questions: Do I have enough subscribers in my list? Is my email mobile-friendly? Do I use attention-grabbing subject lines and preheader text? Do I have actionable CTA button? If all your answers to these questions are no, you may want to double-check your existing email marketing strategy. Remember, successful marketing campaigns are built on a strong strategy. Do you spend more time and money getting new leads? You may want to give equal attention to your existing customers as research shows that 20% (on average) of revenues are from your customer base. You may think it’s just a small percentage but think about it —it costs less convincing making an existing customer purchase again. In fact, acquisition costs are more expensive than retention according to Bain and Company. 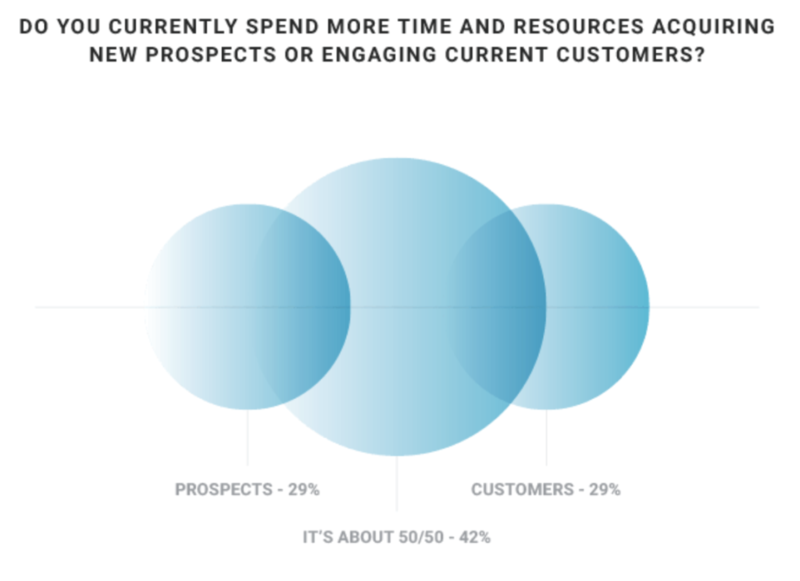 Unfortunately, the 2018 Email Marketing Industry Report shows that only 42% of marketers are devoting equal time and resources for new leads and existing customers. Other respondents are divided into acquisition only and solely current customers. That’s a whopping 58%. So, how do you offer lifetime value to them and hold their attention? Generic and boring emails won’t result in customer retention. It’s all about building a relationship based on what they are interested in. Start-off with welcome email campaigns. Then, using your existing customer’s data, come up with a more personalized content and alerts. Always adjust your tactics based on their behavior so you can reach your target. It’s reported time and time again that personalized emails can do wonders in your campaign—Experian claims that personalized emails can equate to better transaction rates (about six times higher) and Statista notes that personalized emails had an open rate of 18.8%. 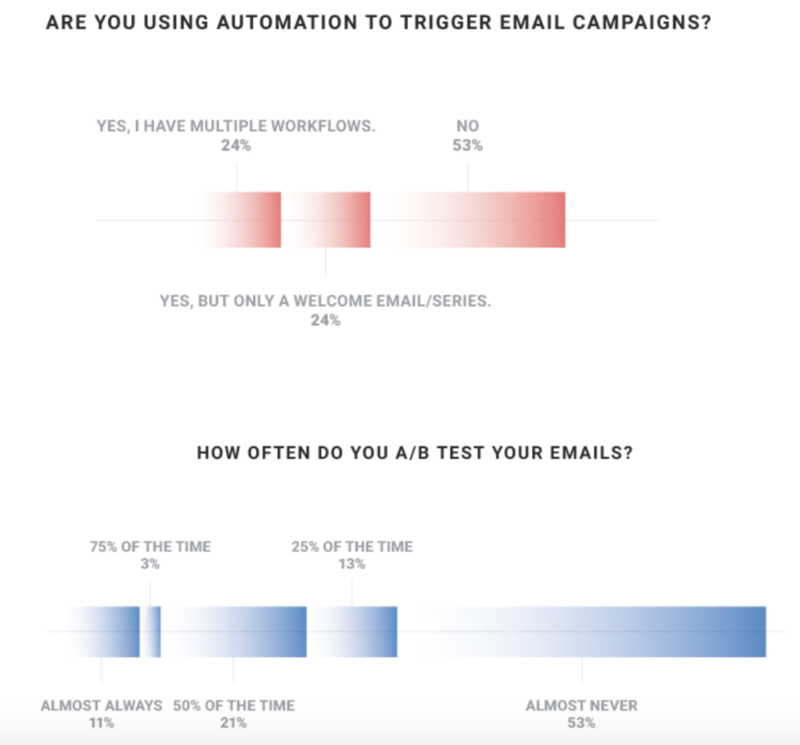 Yet, despite these overwhelming findings, it seems that most email marketers are not adopting this method. 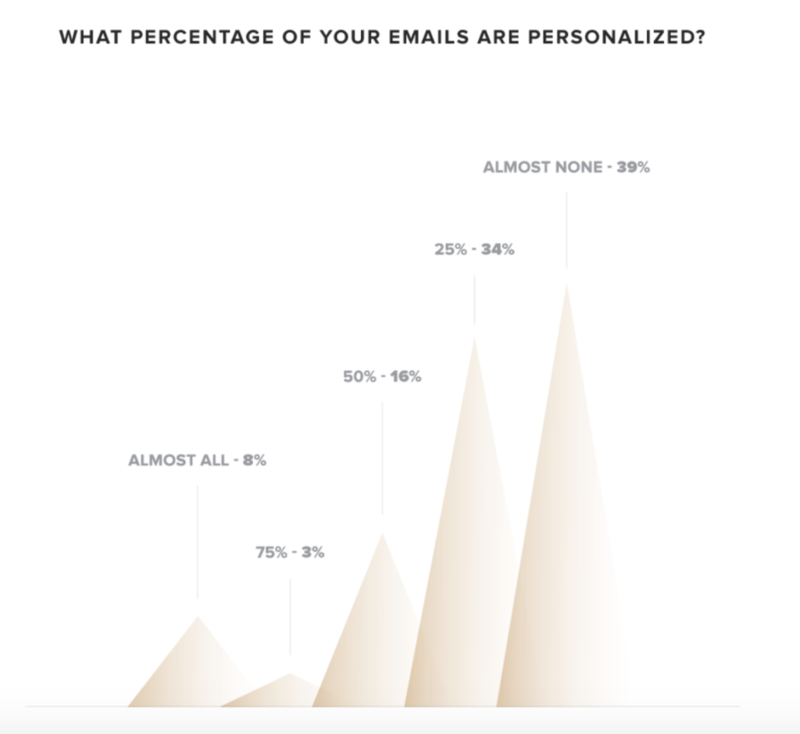 According to 2018 Email Marketing Industry Report, 39% of respondents’ emails are not even personalized at all. What does this mean for you? It signifies that the competition is high for boring and generic emails, a higher probability that your subscribers would just yawn and send your latest email to the trash. If you personalize your email message and not just add the name of your subscriber in the subject line, you may see improved click-through rates and conversions to 14% and 10% respectively. As human beings, it’s natural to have different needs, wants and interests. This also applies in email marketing—subscribers want to get emails that are relevant and useful to them. Through segmentation you can deliver highly valuable information or content to a specific target group, making your campaign somewhat a “one-to-one” approach. 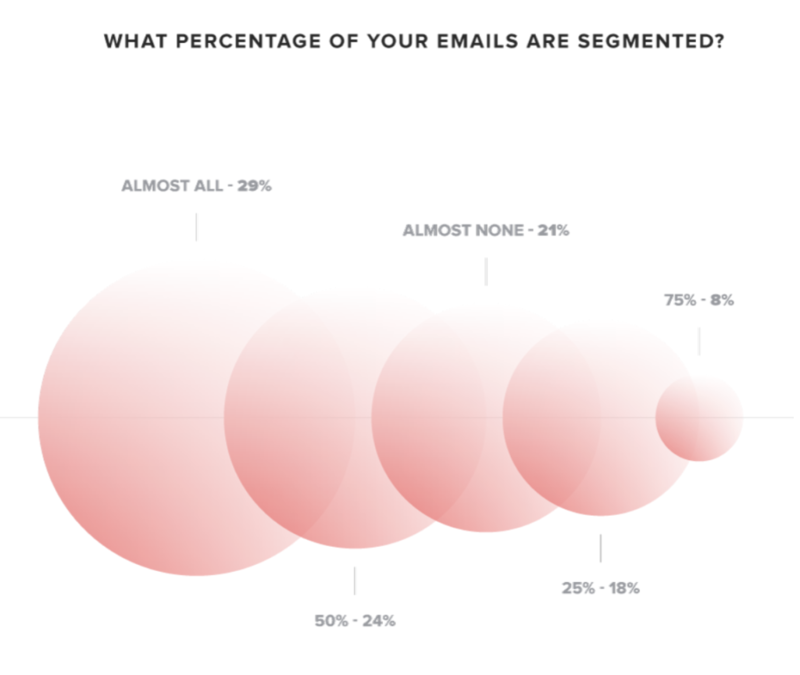 However, just like personalization, segmentation is still being snubbed by marketers—only 29% apply segmentation in their emails according to the 2018 Email Marketing Industry Report. It’s unfortunate since segmented emails mean higher click-through rates (100.95% higher!). Moreover, the Direct Marketing Association (DMA) found that segmented and targeted campaigns generate 58% of revenue. If you aren’t segmenting your emails right now, you can start with analyzing your existing customer database. Check the location, type of customer, gender, age, buying activity, email engagement etc. Then, group your subscribers according to these segments. Figuring out the best marketing strategy for your company can be confusing. A great way to have a clearer and more organized tactic is through split testing or most popularly referred to as A/B testing. It’s experimenting two versions of one variable. Let’s say, you want to know what’s the best subject line to get more open rates. You will send two subject line versions of your email—one for the question type and the other for the sentence format. The subject line that yielded to better results, in this case, open rates, wins (with substantial data to support it, instead of guessing). Sounds simple, right? Unfortunately, marketers are not taking advantage of the power of A/B testing too. The industry report claims that 53% of respondents almost never A/B test. To top it all off, more than 50% aren’t even using automation. In addition to the personalization, segmentation, and ROI findings, the industry report also shows that there is a conflicting definition of marketing success amongst marketers—58% tells that is based on sales and leads while 34% says its engagement and 8% for reach or traffic. Despite the differing views, a majority of them (73% to be exact) are not jumping on the trend bandwagon, like chatbots, live video, and influencer marketing. From the simple word of mouth to tangible marketing materials like flyers, posters, and billboard and digital advertisements, marketing has indeed come a long way. Alongside this growth and progress is a slew of new strategies and tools which sometimes could make one’s mind disorganized and confused. Good thing a more sensible tactic could be applied thanks to a plethora of research and statistics.